Sadly, this year I am way slow at getting my fall decor out. Usually I am super excited to bring on the rustic fall decor, but this year it has been so hot I’m having a hard time getting in the mood. So instead of making obvious fall decor, I decided to make something a little more subtle. 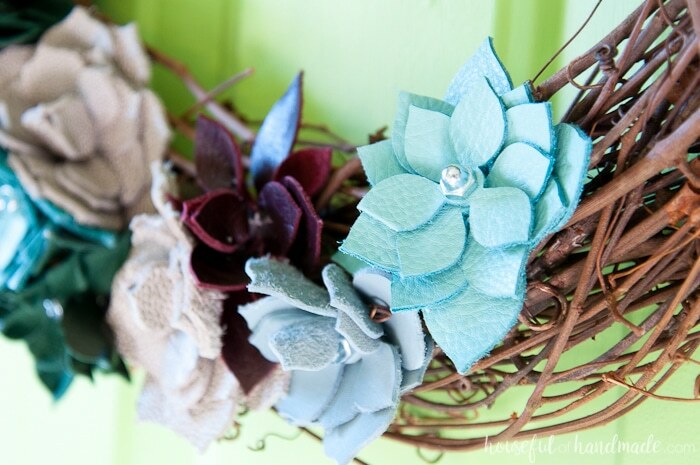 Using some jewel toned leather pieces, I made my new favorite wreath: this beautiful DIY leather succulent wreath. I am a huge fan of succulents. They are one of the few house plants that I don’t immediately kill. I have been known to keep them alive for up to a year! Shocking, I know. 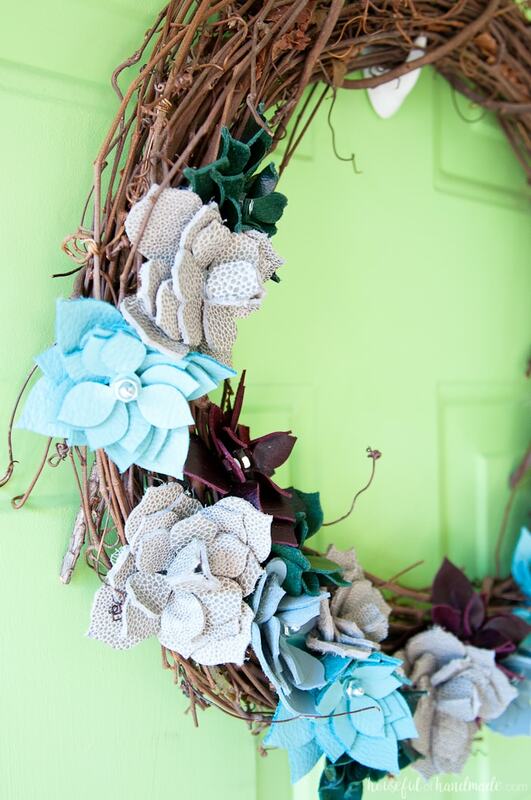 But even with my past success, I knew it was a much better idea to rely on faux succulents for a new wreath. So when I saw the succulent steel rule dies from Spellbinders, I had to have them! After I got my succulent die, I needed to decide what kind of material to use. Felted wool was an obvious choice (and it’s so beautiful I will probably be making some succulents with it too), but since I love trying new types of material in my DIY home decor I wanted to see what else it could cut. I happened to have some scraps of leather (not the pretty stuff I used here, but something to test it out with) and was so excited when it cut through it so easy. 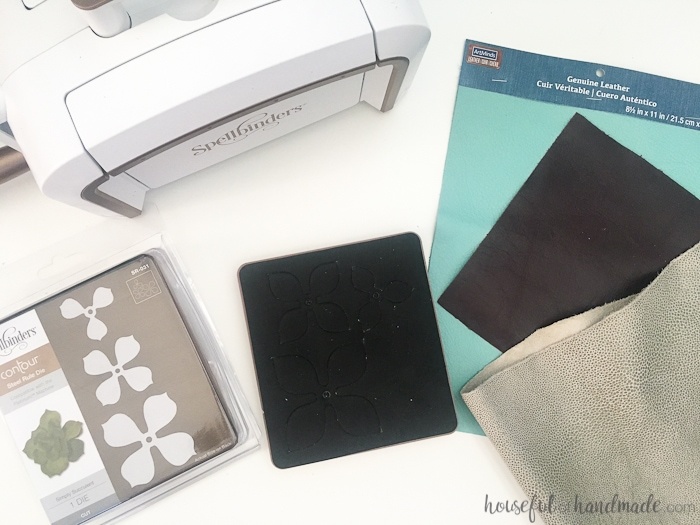 My sister was in town when I was playing with my Platinum 6 machine and she was so excited to see how easy it cut thorough the leather, she ran off to find lots of different colors and textures of leather for us to cut out. I was too busy working on the master bathroom vanity, but she got right to work and cut a whole bunch of succulents before she had to fly home. Luckily for me, she left me the rest of the leather she found. This week I finally got a chance to make my own DIY leather succulent wreath. The leather adds such a unique charm to the succulent wreath, and I decided to use nuts and bolts to hold the leather together for a little industrial accent. 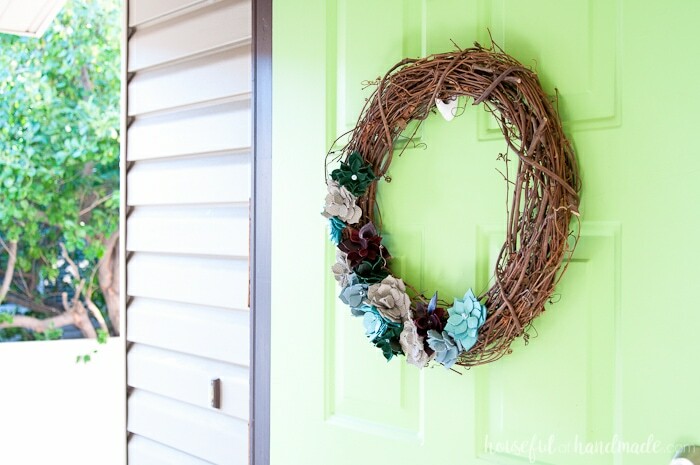 It’s the perfect wreath for any season. I had to text my sister a picture of my wreath as soon as it was done! She picked out such beautiful colors and textures for the succulents. Now maybe she will make some time to finally finish her wreath too. This post is sponsored by Spellbinders. All opinions are my own. This post contains some affiliate links for your convenience. Click here to read my full disclosure policy. Gather your pieces of leather. 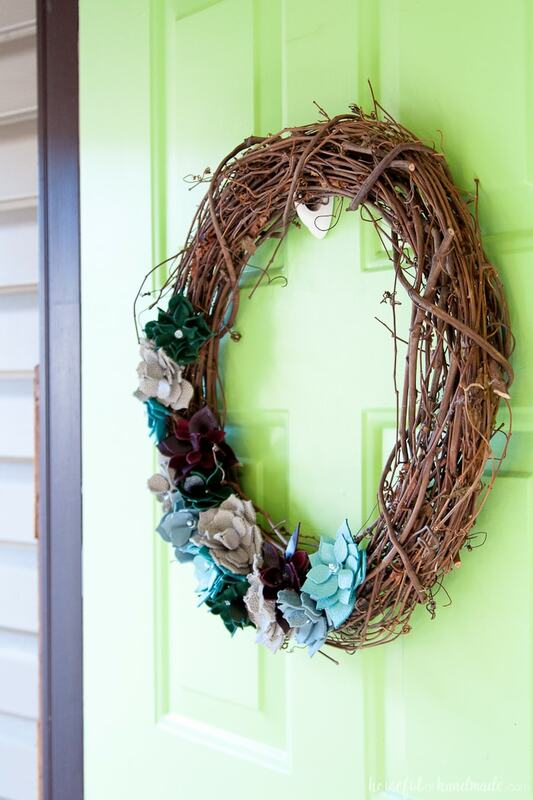 Use a variety of colors, thicknesses, and textures to add dimension to your wreath. I used a total of 5 different types of leather. 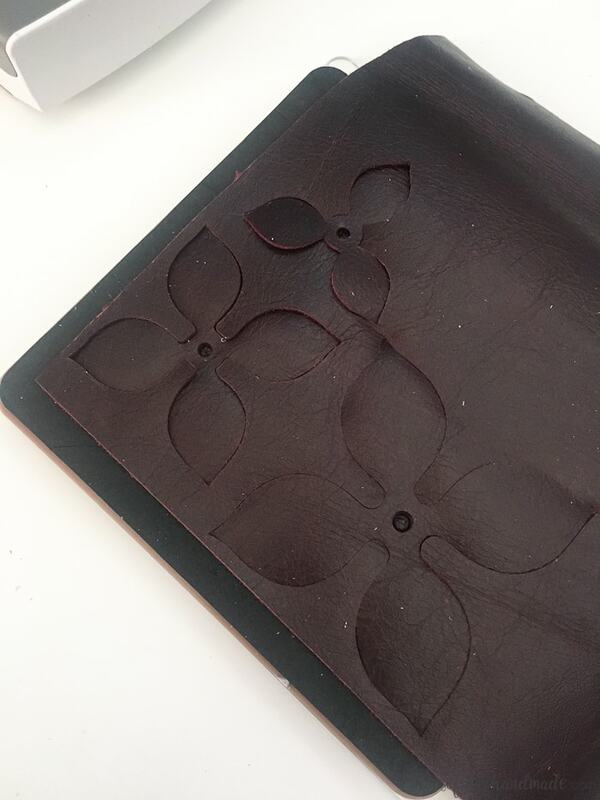 Cut the leather on the Spellbinder Platinum 6 machine using the two succulent steel rule dies. Make a cutting sandwich with the cutting plate, then the steel rule die with the cut side facing up, the leather, then a second cutting plate. Run the cutting sandwich through the machine and it will easily cut through the soft leather. Yeah! 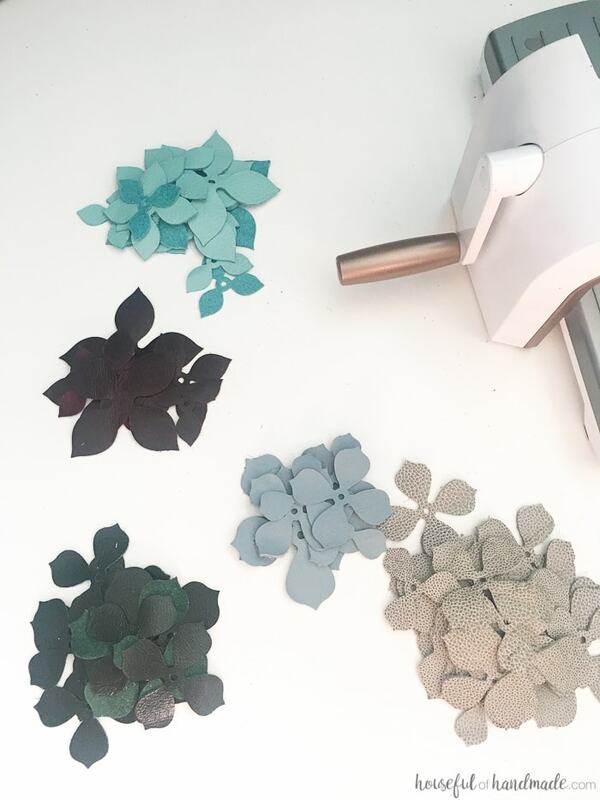 Each die has 3 different sizes of succulent pieces, cut 4-6 pieces per succulent. 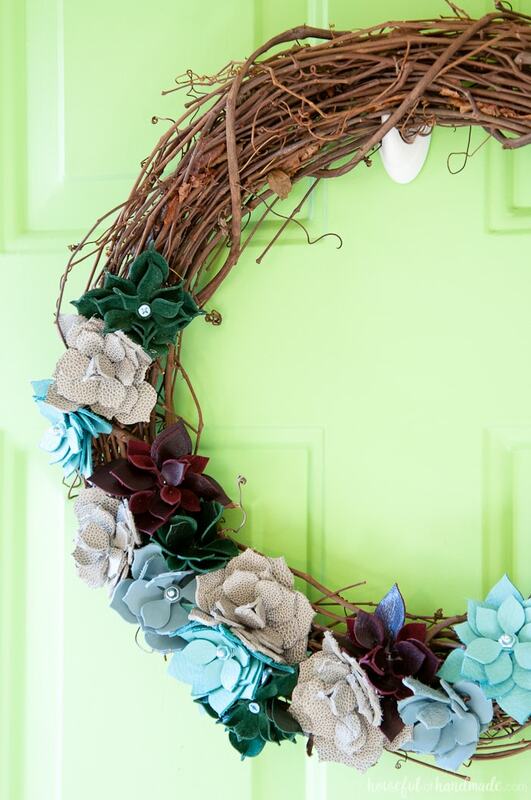 You will want a variety of fuller and smaller succulents to make the wreath. 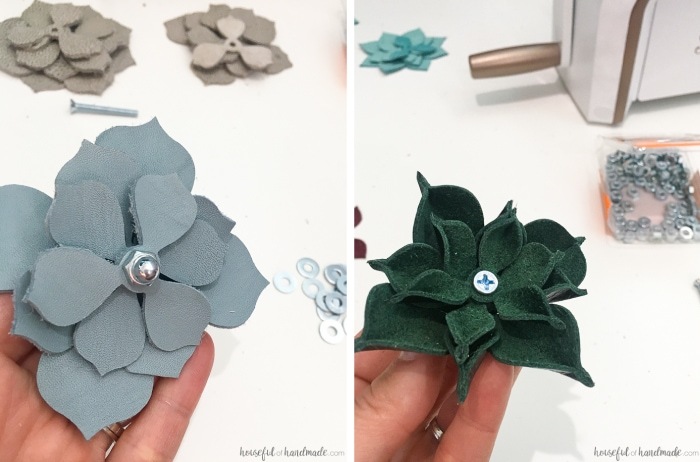 Start making succulents. Twist a nut on the screw close to the bottom. Then layer the pieces of the succulent on top of it with the larger pieces on the bottom and the smaller pieces on the top. For the thicker leather pieces, use a small washer between the pieces to give it some loft. Once the pieces are all layered on the screw, close it off with a screw cap. Then flip the whole thing over and tighten the nut until the pieces all all snug together. 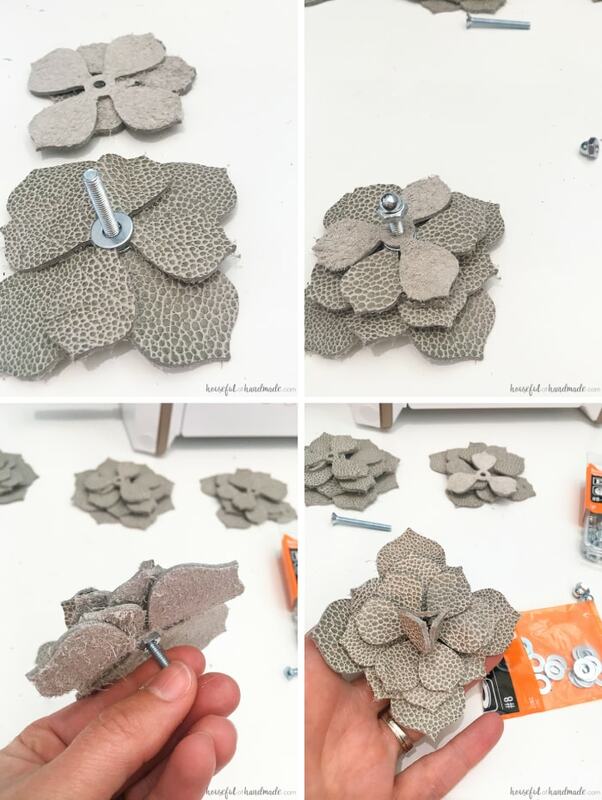 For some of the succulents, I put the top piece on upside down then glued the 3 pieces of the top closed with some hot glue. For the thinner leather, use a nut in between each piece. Then to add a little more loft to the thin leather, add a little dot of wood glue to the inside edge of the leaves and pinch it until it’s curled. Have fun being creative with the succulents. Use a variety of ways to layer them, cap off the top, and curl the leaves. 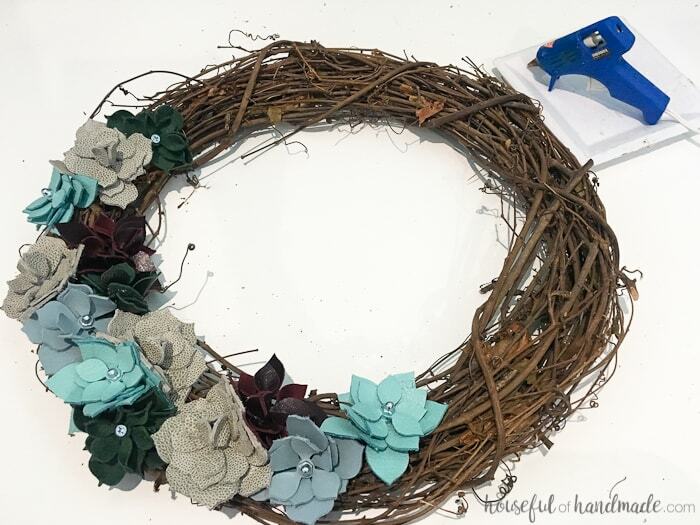 Once you have made all the succulents, layer them onto the wreath by sticking the back of the screws into a grapevine wreath. Arrange them until you are happy. I arranged mine to be asymmetrical. 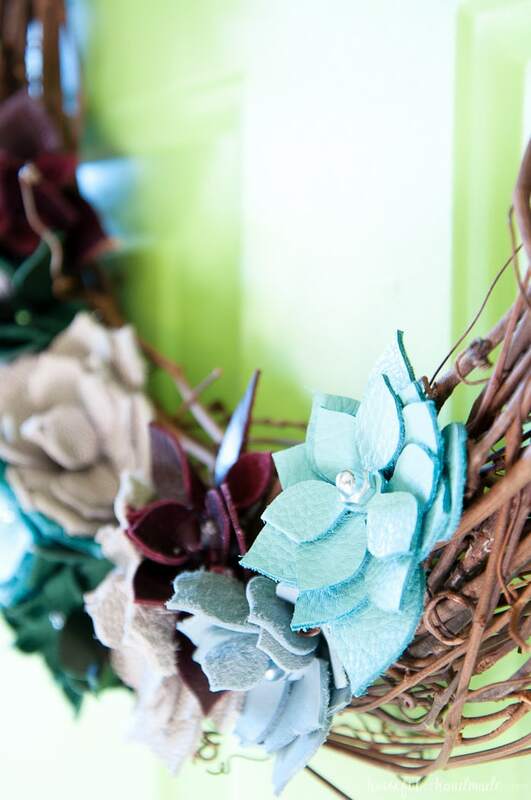 When you are happy with the arrangement, secure the backs of the succulents/screws into the wreath with hot glue. Now your wreath is all done! It’s ready to greet your guests at the front door. And I can’t wait to see what else my new die cut machine can cut. I’m having way too much fun playing with all these new materials. To see what I’ve already cut, click here. Using leather was GENIUS! Love this so much! Thanks Samantha! I love the way the leather turned out. You’ve inspired me to take up my cutting machine crafting again! I have Spellbinders dies, but I only ever used them on paper and used my Cuttlebug. I was so new at the time! Thank you for sharing at Merry Monday! It’s been fun to see what I could cut. I love paper, but the other things are so fun! I adore those little leather succulents! Such a great call on the leather, and you’re right, this could be hung up during any season!! Thanks so much Jenny! I think I want to use bright colored succulents for spring. So many possibilities. 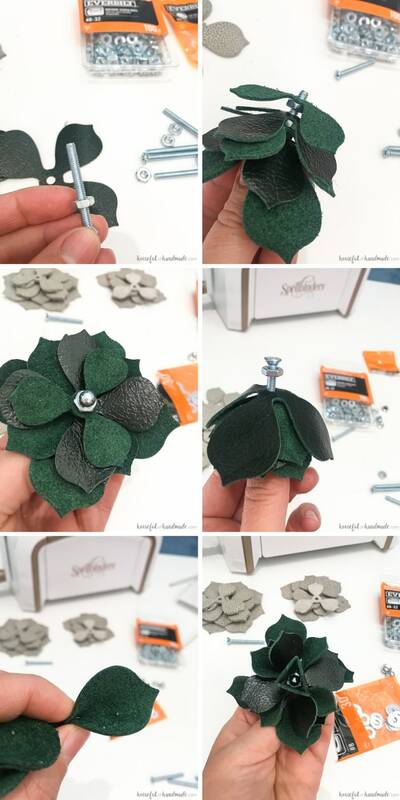 Leather succulents?! SWOON!!! 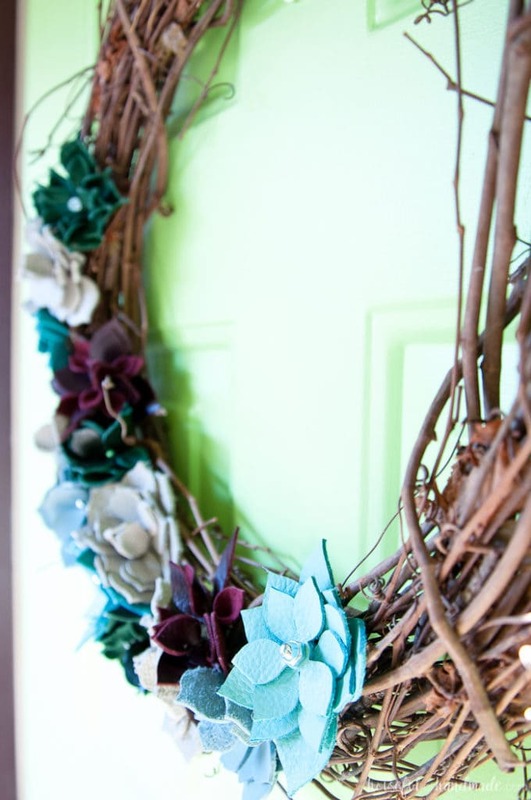 What great texture and beautiful wreath. I had no idea you could use leather in that way! Looks amazing! It was so much fun to make too! Thanks Amy. Oh my gosh, I LOVE the look of the leather succulents! 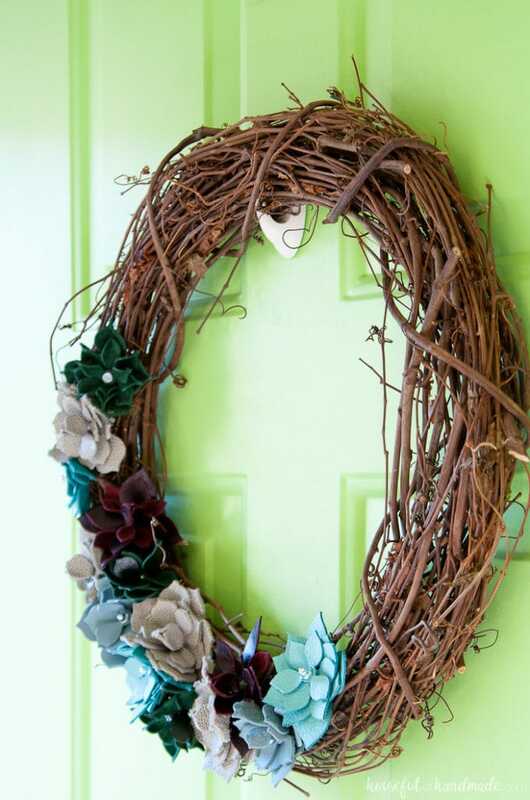 Beautiful wreath – so unique! What a cool idea! 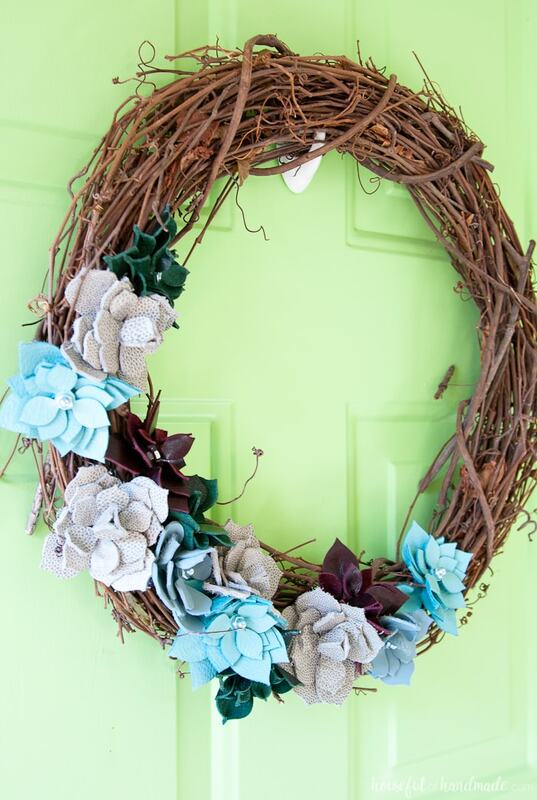 I love making paper flowers but obviously that wouldn’t work on a wreath. I never thought to use leather but that is so clever. Pinned. love love love that you built those using leather! Crazy cool idea girl, and love the colours! Thanks Ariel! It was fun to use something new, I need to make lots of other things with leather now.